Senior Khmer Rouge Leaders Found Guilty Of Crimes Against Humanity : The Two-Way The verdict is the first to be handed down against the top Khmer Rouge leadership. As many as 2 million people died in the regime's "killing fields." The two men will serve life in prison. 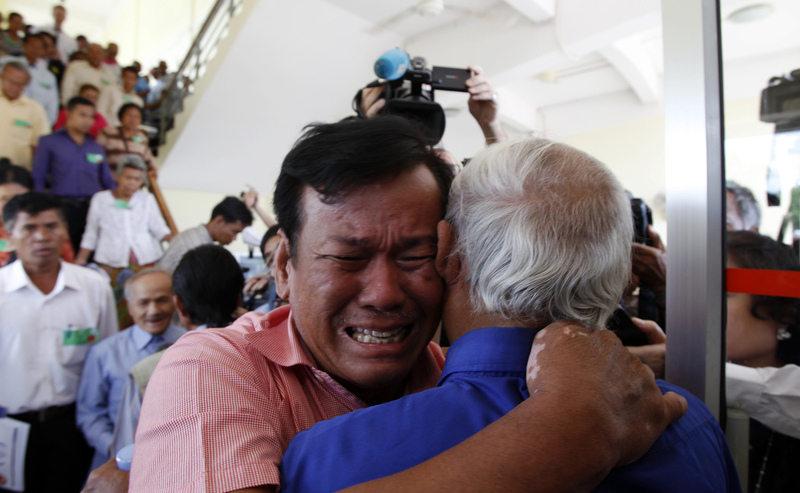 Soum Rithy (center left), who lost family members during the Khmer Rouge regime, and Chum Mey, a survivor of the notorious Tuol Sleng prison, embrace after the verdicts were announced Thursday in Phnom Penh, Cambodia. Two senior Khmer Rouge leaders were found guilty of crimes against humanity in Cambodia on Thursday. As The New York Times explains, the verdict, handed down by a joint Cambodian and United Nations tribunal, is the first against top leaders of the genocidal Khmer Rouge regime. Nuon Chea, the chief lieutenant of Khmer Rouge leader Pol Pot, and Khieu Samphan, who acted as head of state for the Maoist regime, were sentenced to life in prison. "The chief judge, Nil Nonn, said the court found that there had been 'a widespread and systematic attack against the civilian population of Cambodia' and that the two former leaders were part of a 'joint criminal enterprise' that bore responsibility. They were convicted of murder and extermination, among other crimes. "More than 1.7 million people died under Khmer Rouge rule between 1975 and 1979. "The proceedings of the tribunal ... have been criticized as being extremely belated and for covering only a narrow sliver of the crimes perpetrated by the Khmer Rouge. The judgments against Nuon Chea, 88, and Khieu Samphan, 83, were the first to be handed down against the Khmer Rouge leadership, although a lower-ranking official, who ran a notorious prison for the regime in Phnom Penh, was convicted in 2010. Both senior leaders will file appeals, their lawyers said Thursday." "In 1979, Vietnam invaded Cambodia and pushed Pol Pot and his remaining followers into the jungle, where they fought an unsuccessful insurgency for the next two decades. Pol Pot died in 1998 under suspicious circumstances." The Guardian reports that following the verdict, Lars Olsen, a spokesman for the court, called the day "historic." "The victims have waited 35 years for legal accountability, and now that the tribunal has rendered a judgment, it is a clear milestone," Olsen said. The Guardian adds: "A group of 10 victims represented by the International Federation for Human Rights (FIDH) praised the court's decision, saying: 'We will finally be able to mourn our relatives. It was important for us to see those who planned and ordered these crimes be held to account.' "